President Ram Nath Kovind launched the Pulse Polio Immunisation (PPI) programme for 2018 at the Rashtrapati Bhavan in New Delhi. The event was organised on the eve of the National Immunisation Day, which is observed on 28th January. As part of the Government of India's drive, over 17 crore children below five years across the country will be given polio drops. Since 1995, India has been implementing the Pulse Polio Immunization Programme. On 27 March 2014, India and 7 other Asian countries were declared polio-free by the World Health Organisation (WHO). 7 other Asian countries are Bangladesh, Bhutan, North Korea, Thailand, Indonesia, the Maldives and Myanmar. It should be noted that WHO declares any country polio-free if no case is reported for three consecutive years. The Union Minister for Health and Family Welfare J. P. Nadda addressed the crowd saying that India needs to remain vigilant and maintain the immunity of the people and conduct proper surveillance till complete global eradication of polio takes place. The polio virus is still circulating in other parts of the world and may reinfect the people. He mentioned that several efforts were being carried out by the government to protect the children from various diseases. He highlighted the Universal Immunisation Programme which is focusing on safeguarding children from more diseases. It has introduced new vaccines like the Pneumococcal Conjugate Vaccine (PCV) and rotavirus vaccine. In order to provide additional protection to children, the injectable Inactivated Polio Vaccine (IPV) has been introduced by the health ministry in its routine immunisation programme. Many national and sub-national polio rounds with high quality surveillance are conducted by the government to mitigate the risk of polio virus importation and to ensure that the immunity against the infection is maintained. He said that strengthening of immunisation programmes has significantly contributed to the decline in the Infant Mortality Rate from 39 in 2014 to 34 per 1000 live births in 2016. The Health Minister appreciated the efforts of State Governments and the supporting organizations like WHO, UNICEF and Rotary International etc., for strengthening the efforts of the Government not only for polio programme but also for other initiatives in immunization. He also applauded the efforts of the thousands of volunteers, frontline workers and health officials across the states for their tireless efforts in keeping the country polio-free. National Immunization Days (NIDs) are held across India twice a year. 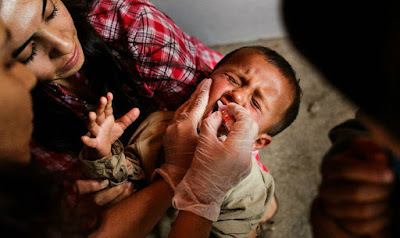 It is carried out by the Government of India under which two drops of oral polio vaccine (OPV) is provided to every child in the country under the age of five.